The tiny town of Tanah Rata is the usual base for budget travelers wishing to explore Malaysia's beautiful Cameron Highlands. With temperatures that dip as low as 50 F at night, Tanah Rata is a welcomed break from Southeast Asia's heat and humidity. Vivid, green tea plantations clinging to the surrounding hills and perpetually blooming flowers lend a sweet smell to the air. The tranquility of the scenery is contagious; the vibe in Tanah Rata is pleasantly relaxed and people are friendly. Jungle walks await the adventurous while strawberry farms and lush greenhouses entertain those wishing to stay closer to civilization. Tanah Rata is ridiculously compact – no map required. Life centers around one main vein passing through the town known as Jalan Besar, or the "Big Road". Small side streets are home to simple budget accommodation as well as pleasant cafes and outdoor eateries. The bus station is located on the very western edge of town. Surprisingly, for a place that receives so many tourists, the official Tourist Information Office in Tanah Rata is closed permanently. The many signs around town offering "tourist information" belong to tour agencies hoping to sell a tour. Accommodation in Tanah Rata is an excellent value - a handful of simple but comfortable budget operations offer cheap places to stay. Many of the budget places have TV rooms and landscaped patios filled with hanging flowers. The camellia sinensis plant - also known as the tea tree – is Tanah Rata's cash crop. Black, oolong, white, and green tea all come from the same leaves of the hardy plant but are processed differently to create the familiar teas that we love. 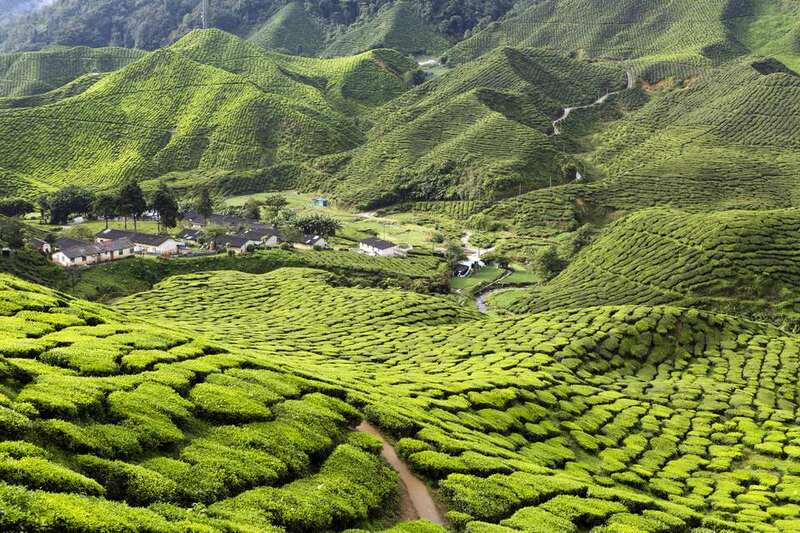 Touring the massive tea plantations is one of the most popular things to do in the Cameron Highlands. Your job at home won't seem so hard once you witness workers at the plantations climbing the hills with massive bags of tea leaves on their back. You can enter and stroll around the peaceful tea plantations on your own for free; many plantations offer free tours of their processing facilities. To gain a deeper insight, tour guides with an excellent knowledge of the tea process can be hired in Tanah Rata. Sungai Palas Boh Tea Estate: Just 15 minutes north of Tanah Rata, this tea estate is possibly the most beautiful and easiest to visit. Take the hourly bus north toward Brinchang and get off at "The Junction" when you see the fruit stalls along the road. Tours are free. Cameron Bharat Tea Estate: A beautiful roadside overlook with a tea shop and outdoor cafe is the best reason to head south of Tanah Rata to this tea plantation. Take the bus south toward Ringlet and ask to exit at the "Scenic Viewpoint". The trails throughout the tea estate are very steep, consider visiting Sungai Palas Boh Tea Estate if you wish to stroll through the fields. After viewing the tea plantations, drop by one of the Indian restaurants for a hot cup of teh tarik - a Malaysian specialty tea - to warm up. The Cameron Highlands is crisscrossed with jungle trails, most of which converge near Tanah Rata or the neighboring town of Brinchang. Most of the trails aren't for the faint of heart - many are steep and poorly maintained. Parit Falls and Robinson Falls are easily reached from town, however, both are lackluster. Guides are available for hire that can walk you up the various summits in the area. If you intend to tackle the trails on your own, the trekking maps sold around town are well worth the $1 price; many of the trailheads are difficult to find without help. The road north of Tanah Rata is lined with pick-your-own strawberry greenhouses, bee farms, butterfly gardens, and souvenir stalls and other tacky tourist attractions. Popular options include sampling local-made honey, trying fresh-picked strawberry juice, and taking in the sweet smells inside the flower greenhouses. You can make your own way north by bus and walk between the sites. Alternatively, tours are offered at guesthouses which include transportation. Food: A string of side-by-side Indian restaurants on the main road serve delicious food on the covered sidewalk. A mostly-empty food court serving cheap eats dominates the center of town. Chinese steamboat and noodle cafes are dotted along Jalan Besar. Money: Two banks reside in Tanah Rata, each is equipped with an ATM. Shopping: Aside from a few sidewalk boutiques offering souvenirs or crafts, there isn't much in the way of shopping around Tanah Rata. Instead, head out of town to the tea plantations, bee farms, and strawberry greenhouses to find unique gifts. The only option for getting to Tanah Rata and the Cameron Highlands is by bus. Being a popular stop along the infamous backpacker's banana-pancake trail, Tanah Rata receives buses from as far away as Singapore! The last hour of the bus journey is a stomach-churning tangle of switchbacks and sharp curves as you wind higher into the hills. Would You Pay $500 to Try This Expensive Fish From Malaysia?